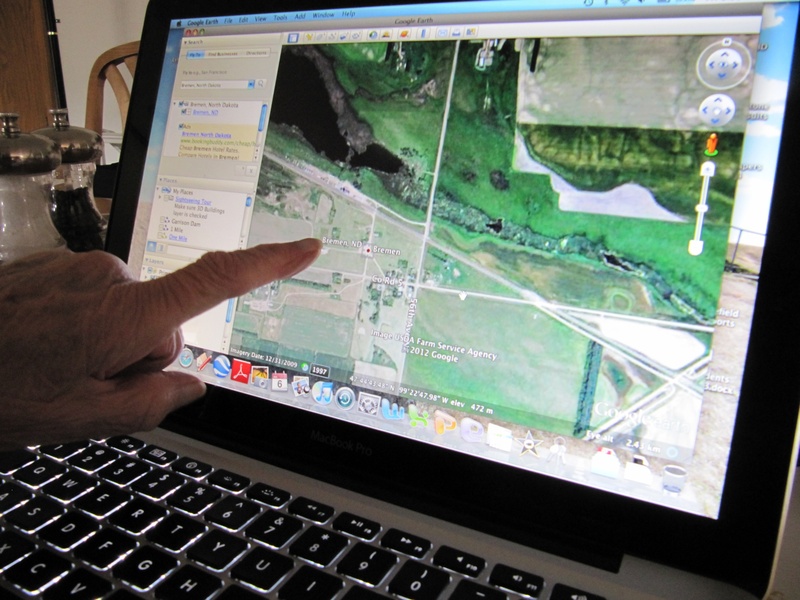 Vivian points to a Google Earth map focused in on the near historic archaeological townsite of Bremen, North Dakota. Her father, H.T. Larson, and his brothers and relations settled in and around Bremen and throughout Valhalla Township. reasons. One of the reasons has to do with identity, or explaining who we can identify with, and how we identify who we are when asked by others. Large genealogical thinkers are often reflected in the form of theologians and naturalists (such as Charles Darwin): they have thought long and hard about where humanity came from, or might have come from. Another reason we are obsessed with genealogy has to do with trying to explain to ourselves and others with better detail where we came from (when we know our origins, it gives us a feeling — delusional or not — that we know exactly where we are going, a way in which to push into the future). It’s a fallacy to think that those in the past had such clarity of vision and that they new exactly where they were going. It is only the present, or present mindedness, that imposes this view on the past. 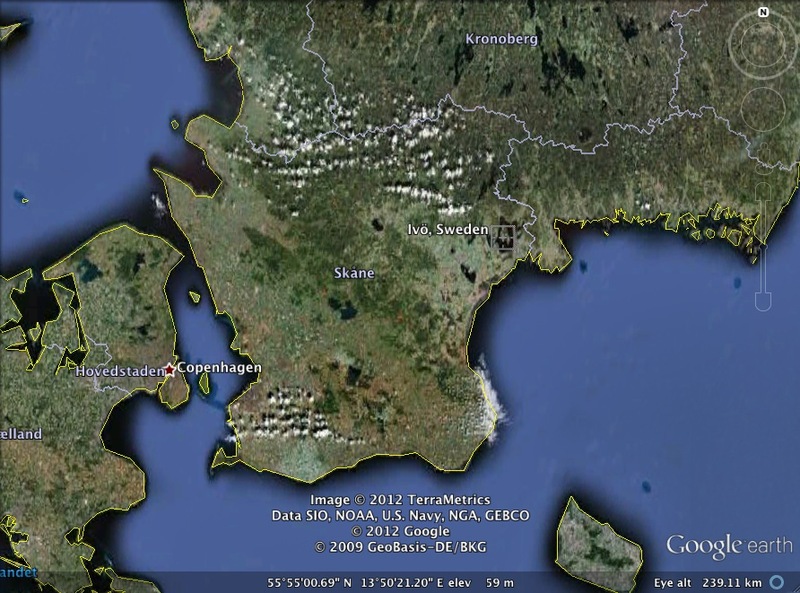 Ivö, Sweden on a Google Earth map. preferred to be called), came to the United States with his Uncle Pehr in 1889. H.T was 13 years old at the time, and he eventually found himself in Willmar, Minnesota (amongst other folks who talked his talk as well). I knew H.T. came from Skåne, but I did not know he came from the eastern portion of Skåne called Ivö. While sitting with Vivian, I pulled Google Earth up on the laptop and typed in “Ivö, Sweden” and hit “return.” The Google Earth map went from the now nearly historic archaeological townsite of Bremen, North Dakota (in northeastern Wells County), zoomed out, and then back in to the rural Ivö setting in southern Sweden. Below is a short clip of Vivian recalling where her father came from. One more ancillary note: does anyone else see a likeness in facial features between my grandma and the sitting Swedish King? Yeah, you’re right, I’m probably just projecting. This entry was posted on Monday, July 16th, 2012 at 9:53 am	and tagged with Genealogy, North Dakota, Sweden and posted in Uncategorized. You can follow any responses to this entry through the RSS 2.0 feed. Such a great story!! Thanks for putting this on of Grandma Barth! !